Dunerbrew: A jump start on cooling? A jump start on cooling? "Don't boil the wort chiller," I was told. ...but that's not what the books say. With 20 minutes left in the boil, you are supposed to put the wort chiller in the wort to give time for the boiling water to kill anything living on it. Then after the boil, flow your cool water through it, to chill the wort. But first that cool water will have to chill the chiller though. I'm not sure why I didn't think about it, but I'm thankful to the Twitter friend who pointed it out. Instead, simply sanitize the chiller like any other component gets sanitized, then after the boil, you can insert a cool chiller with chilled water running through it, giving a jump start to the chilling process. Seems so simple! I'm not sure how much time this will shave off the cooling, but it's bound to help. The key thing is to make sure it is sanitized. What I did was bathe it an a small tub of StarSan, making sure to flip it around to hit all portions of it. I also used a bottle brush to help make sure all nooks and crannies were covered. At the same time, the near boiling water won't be viable to sustain microbe life until it cools some anyway. 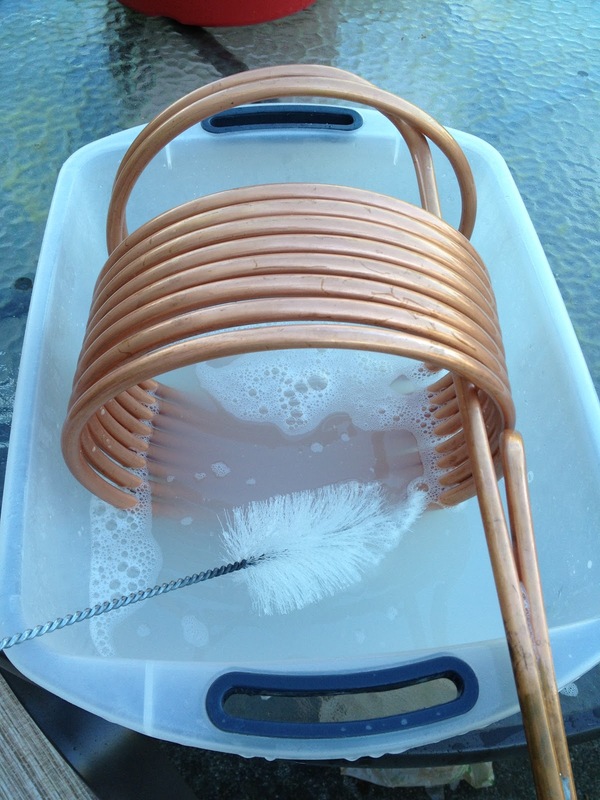 Another trick I saw recently is to coil the hose leading to the chiller in a large bucket full of water with a full frozen gallon jug placed in it. This will theoretically cool the hose allowing the water to get even colder before entering the chiller. It may be particularly helpful here in Florida where the tap water is never cold.